In our last two blogs, we’ve been looking at stress, and why stress is usually more helpful than harmful. It’s not that stress can never be harmful. Stress can be a trigger to some illnesses (although not as many as the popular media often portrays). What is it that makes the difference between helpful and harmful? What is it that causes one person to surf the tsunami of sewerage that often confronts us in life, while another person sinks? The answer lies in resilience. Resilience is the term given to the individual’s capacity to cope. Considering the definitions used, the terms are essentially interchangeable. The other observation to be made here is that coping/resilience is an active process. It’s not something that happens despite of us – we actively cope with stress. In the face of a situation involving emotional arousal (danger or stress), we take steps to deal with our inner and outer environments (the physiological processes of our body, as well as the environment around us). Sometimes these steps are conscious and/or under our control. But theorists also consider automatic, unconscious, and involuntary responses to also be part of the coping spectrum . What makes up those actions? What influences the action steps? Psychologists have described hundreds of individual methods of coping through recent research, although there have been efforts to consolidate the plethora of individual coping strategies into “family” clusters, based on function. For example, a primary tier is to “Coordinate actions and contingencies in the environment” which involves “finding additional contingencies” which on the third level involves “reading, observation, and asking others.”  Table 1 in the paper by Skinner and Zimmer-Gembeck  summarize the many ways of coping and how they can be grouped together into families, and their corresponding adaptive process. Coping strategies follow along the lines of personality type , as well as the stage of development in children . Personality types such as Neuroticism and Openness have been well studied, with Neuroticism associated with maladaptive coping strategies, and Openness correlated with adaptive coping (in marital relationships  and in public speaking tasks ). Further research has shown how personality significantly influences coping, with the severity of the stress, and the age and culture of a person influencing the strategy and strength of the coping response . Of course, personality traits like neuroticism sound bad, but they confer their own strengths. For example, negative affect has protective benefits by enhancing the detection of deception . The shared connection that personality types and coping responses have is in their shared genetics, with personality and coping styles influenced by common genes . This makes perfect sense as it has been shown that changes in individual genes effect the ability of the brain to associate the correct value to rewards , which then influences both mood , and learning . Even though environmental variables are important in determining personality and learning aspects of coping with stress, the brains underlying capacity to process the incoming signals correctly will significantly influence the direction and outcome of the learning process, which includes learning which coping strategies work best for each individual. On a deeper level, there are several biological processes that make up the features of resilience. Animal studies on resilience, as a whole, have shown that resilience “is mediated not only by the absence of key molecular abnormalities that occur in susceptible animals to impair their coping ability, but also by the presence of distinct molecular adaptations that occur specifically in resilient individuals to help promote normal behavioral function.”  That is, resilient individuals have the full complement of critical components in the resilience pathway, and have some extra tools too. Human studies thus far have shown strong links to genetic changes that affect the proteins in the stress system. Epigenetic mechanisms are involved, and the role of the environment is also significant, especially uncontrollable early childhood trauma. Wu et al list the current studies of genetic changes that effect resilience in humans [1: Table 1]. The proteins involved are responsible for the growth of new nerve pathways (BDNF), and for their function, especially within the stress system (CRHR1, FKBP5) and in control of mood and reward systems (COMT, DAT1, DRD2/4, 5-HTTLPR, the HTR group). So coping and resilience are known protective factors for stress, and are more commonly deployed than most people realize. Despite all of the publicity that stress has generated, human beings remain remarkably unscathed. It’s estimated that, “in the general population, between 50 and 60% experience a severe trauma, yet the prevalence of illness is estimated to be only 7.8%.”  (Note: By ‘illness’, the authors were referring to Post Traumatic Stress Disorder, not all of human sickness). But when it comes to recommending different coping strategies on an individual level, it is a much harder thing to do. What is adaptive in some situations and for some people is maladaptive in other situations and for other people. For example, in animal studies, “stressed females tend to perform better than males on non-aversive cognitive or memory tasks … Conversely, in tests of acute stress or aversive conditioning, stress enhances learning in males and impairs it in females … the literature suggests that in cognitive domains females cope better with chronic forms of stress, whereas males tend to cope better with acute stress.”  So animal studies confirm a difference in the biological stress response between men and women. If these studies in animals can be extended to humans, it may explain the tendency for men to engage in “fight-or-fight” responses to stress where women usually move to “tend-and-befriend” mode . So in other words, just because engaging may be a positive method of coping does not mean that it should be recommended to everyone. Some people will have more harm from trying to engage. Care should be taken when giving people advice about how to manage their stress. Ill-informed instructions can actually make things worse. It’s well established that stress can have negative impacts on your physical and mental health. But contrary to the popular view, stress is not always bad. As a number of authors point out, most people go through significant stress at some point in their lives, but only a fraction succumb to that stress. The difference is the factors that make up resilience. Where we are along the stress spectrum (that is, whether you are wired to be more stressed, or more resistant to stress) depends on our genetic predisposition, which determines the physiology of our stress system and our personality, and the ways we learn to cope. How we cope best depends on our individual traits and the situation. There is no one-size-fits-all. Pushing a person into a form of coping that’s not suitable can actually cause a lot of harm. Remember, we normally find what coping strategies work for us automatically as our resilience is mostly innate, and we all go through severe stress at some point or another in our lives, but only a small fraction of us will succumb to that stress. In the last blog in the series, we’ll have a brief look at what happens when stress overwhelms us … when stress is breaking bad. In the last blog post, we looked at some of the different ways of looking at stress outside of the medical field – the stress on a guitar string, the power band of the car engine, and the action of gravity on our bodies. In this post, I want to expand on those metaphors, using them to help us understand how we can respond to stress, and why stress isn’t our enemy, but it actually brings out our best if managed in the right way. One of the reasons why gravity gives you strong muscles and bones, and zero gravity gives you weak muscles and bones, is because of resistance. Movement involves work. We do “work” everyday in simple everyday activities, because our muscles and bones have to apply a certain amount of force in order to overcome gravity. Our muscles adapt by growing the muscle fibres to provide that force, and bones remodel themselves to provide the maximum resistance to the loads that gravity and the muscles put through them. We’re not aware of this day-to-day because we never experience prolonged changes in our gravitational fields. But when we need to do more work than our muscles are accustomed to, our muscle fibres increase in strength, first as the nerve networks that supply the muscles become more efficient, after about two weeks of ongoing training, the fibres themselves increase in size [1, 2]. The growth in muscle fibres is caused by three related factors: mechanical tension, muscle damage and metabolic stress . Mechanical tension involves “force generation and stretch”. In other words, the muscle fibres are stretched just beyond their usual capacity, and they actively fight against the resistance. This damages the weaker muscle fibres, which are repaired. The remaining muscle fibres are forced to adapt by growing larger because of the stimulation of growth factors . 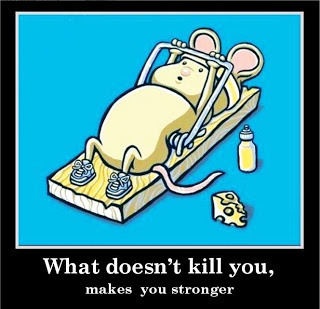 One of my favorite “Demotivator” posters says, “That which does not kill me postpones the inevitable” . Of course, the phrase that they’ve parodied is, “That which does not kill us makes us stronger.” Why is there truth to that idiom? Adversity occurs when life circumstances come against us. In other words, adversity resists us. In the arm wrestle between adversity and overcoming, work is involved. We have to fight back. In a similar way, we grow when adversity pushes us just beyond what we have done before, stretching us. We may sustain some damage in the process, but that helps to reduce our weaknesses, and forces us into growth as we heal. When we push back against adversity, the “cells” of our character grow. Of course, we all know examples where muscles fail under intense or prolonged loads. I vividly remember the pictures of the UK’s Paula Radcliffe, succumbing to the grueling hills and scorching Athens heat with only four miles left in the 2004 Olympic Marathon. Muscle failure from excessive stretch or excessive endurance parallels the allostatic load response, which is what people commonly referred to as ‘stress’. There have been recent studies in animals that demonstrate that stress is physically as well as mentally enhancing. Neurogenesis is the process of new nerve cell formation. Studies of rodents placed under intermittent predictable stressors showed an increase in neurogenesis within the hippocampus, which is the part of the brain related to learning and memory. Along with this enhancement of neurogenesis, the function of the hippocampus increased, specifically hippocampal-dependent memory, with a reduction in depression and anxiety-like behaviours. So what can we learn from stress? How do we use the stress that we are exposed to every day to make us grow strong and durable? Firstly, like the guitar string, we need to learn when we are in tune, at the peak of our productivity. Or like the car engine, what it feels like to be in the power band. When we know where our sweet spot is, we can operate within it, achieving our best in life without doing ourselves harm. This is the first point that we need to identify on our own personal stress/productivity curve. This is the point of maximum productivity. The other life principle to be gained from the car engine analogy is that not all of us are high performance engines. I would love to think that I’m a F1 racing engine – highly tuned, supreme power – but I recognise my limitations. I would even settle for a 5-litre V8, but I know that I’m probably more like a well-tuned V6. We are what we are. Sometimes we apply the most stress to ourselves when we try to drive in the power band of someone else’s engine. We need to accept who we are. It seems logical that if too much stress is bad for us, then having little or no stress is good for us. But like the new guitar string, minimal stress makes us unproductive. Like zero gravity on the body, little or no stress makes us weak. And we need to understand that a bit more stress is ok. It’s inevitable that we are going to be stressed beyond what we usually cope with at times. But without that challenge, there would be no growth. Challenges usually hurt. You can’t have growth without pain. In the muscle analogy, at the stretch at which peak growth occurs, muscle fibres tear and the lactic acid build up in the remaining cells can be very uncomfortable. The key is learning how far we can push ourselves before we start to falter and fail. This is the second point we need to discover on our personal stress/productivity curve. This is the point of maximum growth. Once we understand our own individual points of maximum productivity and growth, we can use them as guides to our personal growth and achievement. Actually, I should specify that these are our starting points, since as we face challenges and experience growth, the points will change slightly. We can remap those points and continue in our pattern of growth and development. Pushing ourselves into just enough stress to achieve growth, then pulling back to rest and restore, is a pattern of growth that is seen in many facets of the natural world and the human body. Body builders and athletes use this method all the time in their training. They push themselves with more repetitions and heavier weights, or longer or faster runs, then they pull back to consolidate their gains. During our adolescence, our bodies naturally go through growth spurts – periods of rapid growth followed by a plateau, before the next burst of growth hormone hits us again. Even tree rings demonstrate that growth and consolidation occur all the way through the natural world. This is the Stressed-Rest cycle. The studies in animals on neurogenesis strengthen the theory, because it was the animals that experienced bursts of stress that showed enhanced neurogenesis, memory and reduced depression/anxiety behaviours. If you want maximum personal growth, constant stress does not help. There has to be times of rest. Some people think that rest time is wasted time, reducing productivity. But as explained, without rest time, productivity rapidly falls away. Without rest, stress goes bad, leading to allostatic overload. So in summary, excessive stress is bad. But if all stress were bad, then we would all crumple any time that something became difficult. So stress is not a force for evil. Stress is part of our normal everyday lives, and is vital if we are to see ongoing personal growth. We know from living life that we all don’t fall in a heap when things go wrong. We have in-built ways of coping that help us to absorb troubles and adversities and like emotional photosynthesis – turn them into fuel for growth. This is the science of resilience, the counterbalance to the forces of stress that help us cope and adapt in a rapidly changing natural and social environment, the Yang to allostatic overload’s Yin. A discussion on the science of stress is not complete without a discussion of resilience, which I’ll discuss in the next blog in this series. Adversity. Demotivators [cited July 2013]; Available from: http://www.despair.com/adversity.html. 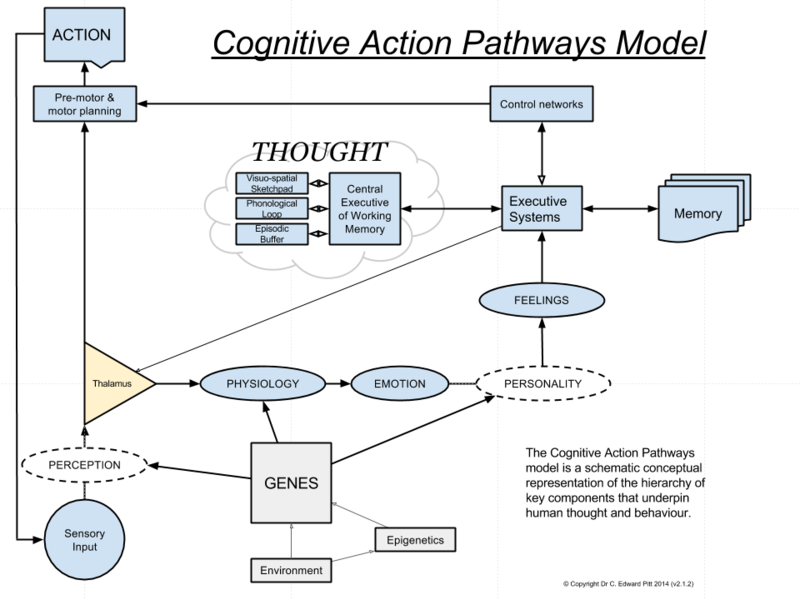 In the last blog post, I discussed the Cognitive Action Pathways model, a schematic conceptual representation of the hierarchy of key components that underpin human thought and behaviour. Small changes in the early processes within the Cognitive-Action Pathway model can snowball to effect every other part of the process. A real life example of this is ASD, or Autism Spectrum Disorder. ASD has been present since time immemorial. Numerous bloggers speculate that Moses may have had ASD, while a couple of researchers proposed that Samson was on the spectrum (although their evidence was tenuous ). Thankfully, autism is no longer considered a form of demon possession or madness, or schizophrenia, or caused by emotionally distant “refrigerator mothers”, nor treated with inhumane experimental chemical and physical “treatments” [2, 3]. The autism spectrum is defined by two main characteristics: deficits in social communication and interaction, and restricted repetitive patterns of behaviour. People on the autism spectrum also tend to have abnormal sensitivity to stimuli, and other co-existing conditions like ADHD. The full diagnostic criteria can be found in DSM5. The new criteria are not without their critics [4-6], but overall, reflect the progress made in understanding the biological basis of autism. ASD is recognized as a pervasive developmental disorder secondary to structural and functional changes in the brain that occur in the womb, and can be detected as early as a month after birth . In the brain of a foetus that will be born with ASD, excess numbers of dysfunctional nerve cells are unable to form the correct synaptic scaffolding, leaving a brain that is large [8, 9], but out-of-sync. The reduced scaffolding leads to local over-connectivity within regions of the brain, and under-connectivity between the regions of the brain . The majority of the abnormal cells and connections are within the frontal lobe, especially the dorsolateral prefrontal cortex and the medial prefrontal cortex , as well as the temporal lobes . The cerebellum is also significantly linked to the autism spectrum . There is also evidence that the amygdala and hippocampus, involved in emotional regulation and memory formation, are significantly effected in ASD . There is also strong evidence for an over-active immune system in an autistic person compared to a neurotypical person, with changes demonstrated in all parts of the immune system, and the immune system in the brain as well as the rest of the body . These immune changes contribute to the reduced ability of the brain to form new branches as well as develop new nerve cells or remove unnecessary cells. There are a number of environmental and epigenetic associations linked to autism. These include disorders of folate metabolism [15, 16], pollutants , fever during pregnancy  and medications such as valproate and certain anti-depressants [19, 20] which are linked with an increase in autism. Supplements such as folate [15, 21], omega-6 polyunsaturated fatty acids  and the use of paracetamol for fevers in pregnancy  have protective effects. Although these factors are important, genes outweigh their influence by about 4:1. Twin studies suggest that between 70-90% of the risk of autism is genetic [23, 24]. Individual gene studies have only shown that each of the many single genes carry about a one percent chance each for the risk of autism . It’s been proposed that the hundreds of genes linked with autism [10, 25] are not properly expressed (some are expressed too much, some not enough). The resulting proteins from the abnormal gene expression contribute to a different function of the cell’s machinery, altering the ability of a nerve cell to fully develop, and the ability of nerve cells to form connections with other nerve cells . The effects are individually small, but collectively influential . Autism is considered a complex genetic disorder involving rare mutations, complex gene × gene interactions, and copy number variants (CNVs) including deletions and duplications . According to the Cognitive-Action Pathways model, the triad of the environment, epigenetics, and genes influence a number of processes that feed into our actions, thoughts, perceptions, personality and physiology. In ASD, the starting place is language processing. New born babies from as young as two days old prefer listening to their own native language , which suggests that we are born already pre-wired for language. Auditory stimuli (sounds) are processed in the temporal lobes, including language processing. In neurotypical people, language processing is done predominantly on the left side, with some effect from the right side. But in people with autism, because of the abnormal wiring, there is only significant activity of the right temporal lobe . Even more, from data so recent that it’s pending publication, loss of the processing of information of the left temporal lobe reversed the brains orientation to social and non-social sounds, like the sound of the babies name . The change in the wiring of the left and right temporal lobes then alters the processing of language, specifically the social significance of language and other sounds. So already from a young age, people with autism will respond differently to environmental stimuli compared to a neurotypical person. In the same way, the fusiform gyrus is part of the brain that processes faces. It’s quite specific to this task in a neurotypical person. However, the altered wiring of the brain in someone with autism causes a change, with different parts of the brain having to take up the load of facial processing . Each time that one part of the brain can’t perform it’s normal function, the other parts take up the load. However that reduces the capacity for those parts of the brain to perform their own normal functions. In the case of the temporal lobes and the fusiform areas, this results in a reduced ability to discern subtleties especially those related to recognizing social cues. A neurotypical person and an autistic person could be standing in front of the same person, listening to the same words, and seeing the same facial expressions, but because of the way each persons brain processes the information, the perception of those words and cues can be completely different. This demonstrates how genetic changes can lead to changes in the perception of normal sensory input, resulting in differences in the physiological response, emotions, feelings, thoughts and actions, despite identical sensory input. The same changes that effect the cerebral cortex of the brain also have an influence on the deeper structures such as the hippocampus and the amygdala. The hippocampus is largely responsible for transforming working memory into longer term declarative memory. Studies comparing the size of the hippocampus in ASD children have shown an increase in size compared with typical developing children . Combined with the deficits in the nerve cell structure of the cerebellum , autistic children and adults have a poor procedural memory (action learning, regulated by the cerebellum) and an overdeveloped declarative memory (for facts, regulated by the hippocampus). This has been termed the “Mnesic Imbalance Theory” . The amygdala is also functionally and anatomically altered because of the changes to the nerve cells and their connections. The amygdala is larger in young children with ASD compared to typically developing children. As a result, young ASD children have higher levels of background anxiety than do neurotypical children . It’s proposed that not only do ASD children have higher levels of background anxiety, they also have more difficulty in regulating their stress system, resulting in higher levels of stress compared to a neurotypical child exposed to the same stimulus . On a chemical level, autism involves genes that encode for proteins involved in the transport of key neurotransmitters, serotonin and dopamine. Early evidence confirms the deficits of the serotonin and dopamine transporter systems in autism . These neurotransmitters are integral to processing the signals of mood, stress and rewards within the brain, and as discussed in the last chapter, are significantly involved in the genesis of personality. The abnormal neurotransmitter systems and the resulting deficiencies in processing stress and rewards signals contribute to a higher correlation of neuroticism and introverted personality styles in children with autism symptoms [35, 36]. So people with autism genes are going to process stress and rewards in a different way to the neurotypical population. As a result, their feelings, their thoughts and their resulting actions are tinged by the differences in personality through which all of the incoming signals are processed. The underlying genes and neurobiology involved in autism also effect the final behavioural step, not only because genes and sensory input influence the personality and physiology undergirding our feelings and thoughts, but also because they cause physical changes to the cerebellum, the part of the brain involved in fine motor control and the integration of a number of higher level brain functions including working memory, behaviour and motivation [13, 37]. When Hans Asperger first described his cohort of ASD children, he noted that they all had a tendency to be clumsy and have poor handwriting . This is a good example of how the underlying biology of ASD can effect the action stage independently of personality and physiology. The cerebellum in a person with ASD has reduced numbers of a particular cell called the Purkinje cells, effecting the output of the cerebellum and the refined co-ordination of the small muscles of the hands (amongst other things). Reduced co-ordination of the fine motor movements of the hands means that handwriting is less precise and therefore less neat. A running joke when I talk to people is the notoriously illegible doctors handwriting. One of the doctors I used to work with had handwriting that seriously looked like someone had dipped a chicken’s toes in ink and let it scratch around for a while. My handwriting is messy – a crazy cursive-print hybrid – but at least it’s legible. I tell people that our handwriting is terrible because we spent six years at medical school having to take notes at 200 words a minute. But it might also be that the qualities that make for a good doctor tend to be found in Asperger’s Syndrome, so the medical school selection process is going to bias the sample towards ASD and the associated poor handwriting (Thankfully, those that go on to neurosurgery tend to have good hand-eye coordination). But if your educational experience was anything like mine, handwriting was seen as one of the key performance indicators of school life. If your handwriting was poor, you were considered lazy or stupid. Even excluding the halo effect from the equation, poor handwriting means a student has to slow down to write neater but takes longer to complete the same task, or writes faster to complete the task in the allotted time but sacrificing legibility in doing so. Either way, the neurobiology of ASD results in reduced ability to effectively communicate, leading to judgement from others and internal personal frustration, both of which feedback to the level of personality, molding future feelings, thoughts and actions. By the time all the signals have gone through the various layers of perception, personality and physiology, they reach the conscious awareness level of our stream of thought. I hope by now that you will agree with me that thought is irrevocably dependent on all of the various levels below it in the Cognitive-Action Pathways Model. While thoughts are as unique as the individual that thinks them, the common genetic expression of ASD and the resulting patterns in personality, physiology and perception lead to some predictable patterns of thought in those sharing the same genes. As a consequence of the differences in the signal processing, the memories that make their way to long-term storage are also going to be different. Memories and memory function are also different in ASD for other neurobiological reasons, as described earlier in the blog with the Mnesic Imbalance Theory. The Cognitive-Action Pathways model is a way of describing the context of thoughts to other neurological processes, and how they all interact. It shows that conscious thoughts are one link of a longer chain of neurological functions between stimulus and action – simply one cog in the machine. The autistic spectrum provides a good example of how changes in genes and their expression can dramatically influence every aspect of a person’s life – how they experience the world, how they feel about those experiences, and how they think about them. I used autism as an example because autism is a condition that’s pervasive, touching every aspect of a person’s life, and provides a good example of the extensive consequences from small genetic changes. But the same principles of the Cognitive-Action Pathways Model apply to all aspects of life, including conditions that are considered pathological, but also to our normal variations and idiosyncrasies. Small variations in the genes that code for our smell sensors or the processing of smells can change our preferences for certain foods just as much as cultural exposure. Our appreciation for music is often changed subtly between individuals because of changes in the structure of our ears or the nerves that we use to process the sounds. The genetic structure of the melanin pigment in our skin changes our interaction with our environment because of the amount of exposure to the sun we can handle. So in summary, this blog was to set out the place that our thoughts have in the grand scheme of life. Thought is not the guiding or controlling force, it is simply a product of a number of underlying functions and variables. WebMD: The history of autism. 2013 [cited 2013, August 14]; Available from: http://www.webmd.com/brain/autism/history-of-autism. Pierce, K. Exploring the Causes of Autism – The Role of Genetics and The Environment (Keynote Symposium 11). in Asia Pacific Autism Conference. 2013. Adelaide, Australia: APAC 2013. Romero-Munguía, M.A.n., Mnesic Imbalance and the Neuroanatomy of Autism Spectrum Disorders, in Autism – A Neurodevelopmental Journey from Genes to Behaviour, Eapen, V., (Ed). 2011 Edition 1st, InTech. p. 425-44. A word of caution: While there’s good evidence that valproate increases the risk of autism, and a possible link between some anti-depressants and autism, that risk has to be balanced with the risk to the baby of having a mother with uncontrolled epilepsy or depression, which may very well be higher. If you’re taking these medications and you are pregnant, or want to become pregnant, consult your doctor BEFORE you stop or change your medications. Work out what’s right for you (and your baby) in your unique situation. Dr Caroline Leaf is a communication pathologist and a self-titled cognitive neuroscientist. 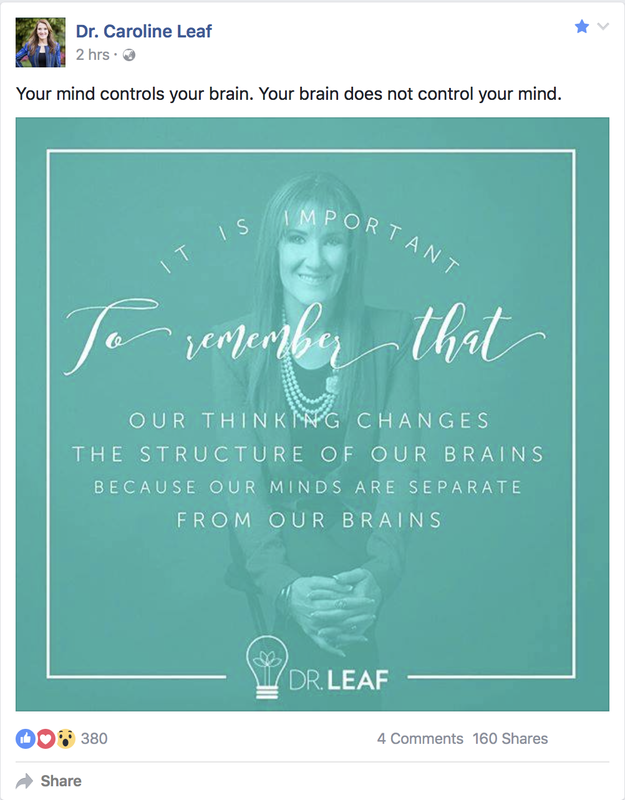 Reading back through my blogs, this “thought controls the brain / mind controls matter” is a recurrent theme of hers. 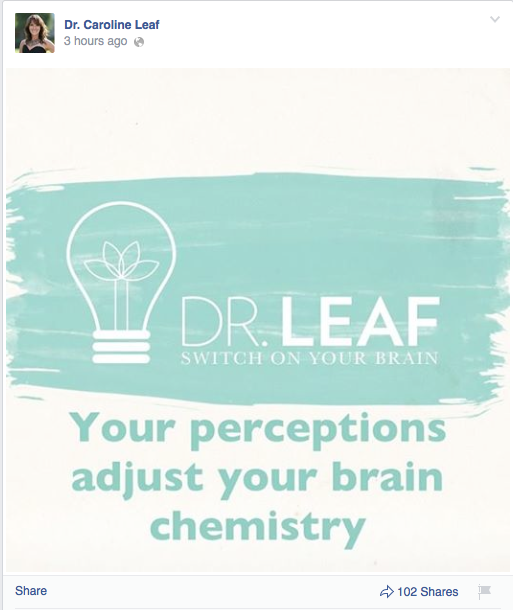 It is repeated multiple times in her books, like when she writes, “Thoughts influence every decision, word, action and physical reaction we make.” [1: p13] and “Our mind is designed to control the body, of which the brain is a part, not the other way around. Matter does not control us; we control matter through our thinking and choosing” [2: p33] just as a couple of examples. 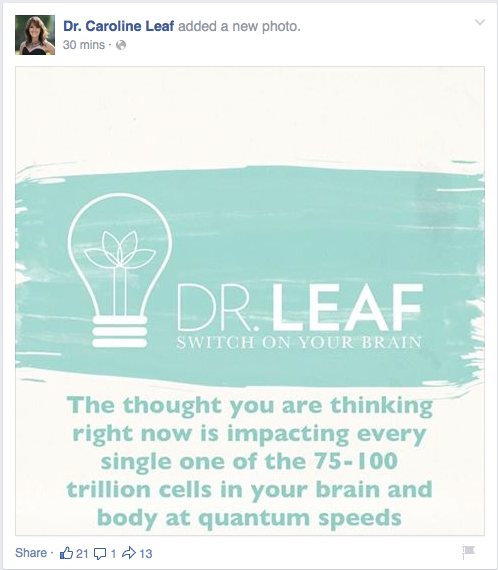 So how does thought relate to the grand scheme of our brain and it’s processing? Does our thought really control our brain, or is it the other way around. Through all of the reading that I have done on neuroscience, I propose a model of the place of thought in relation to the rest of our brains information processing. It is based on the LIDA model, dual systems models, and other neuroscientific principles and processes. We’ve all heard the phrase, “It’s just the tip of the iceberg.” It comes from the fact that icebergs are made of fresh water, which is nine-tenths less dense than seawater. As a result, ten percent of an iceberg sits above the waters surface with most of it hiding beneath. The information processing of our brains is much the same. We may be aware of our conscious stream of thought, but there is a lot going on under the surface that makes our thoughts what they are, even though we can’t see the process underneath. What’s going on under the surface is a complex interplay of our genes and their expression which controls the structure and function of our brains, which effects how we perceive information, how we process that information and combine it into our memories of the past, predictions of the future, and even the further perception of the present . We start with the most fundamental level of our biological system, which is genetics. It becomes clear from looking at any textbook of biological sciences that genes are fundamental to who we are. From the simplest bacteria, fungi, protozoans and parasites, through to all plants, all animals and all of human kind – EVERY living thing has DNA. DNA is what defines life in the broadest sense. Proteins are responsible for the size, shape and operation of the cell. They make each tissue structurally and functionally different, but still work together in a highly precise electrochemical synchrony. But ultimately, it’s our genes that hold all of the instructions to make every one of the proteins within our cells. Without our genes, we would be nothing more than a salty soup of random amino acids. Epigenetics and the environment contribute to the way genes are expressed. Epigenetics are “tags” on the strand of DNA that act to promote or silence the expression of certain genes (I discuss this in more detail in chapter 12 of my book, https://www.smashwords.com/books/view/466848). Environmental factors (the components that make up the world external to our bodies) can influence genes and epigenetic markers. The environment can cause genetic mutations or new epigenetic marks that change the function of a particular gene, and depending on which cell they effect (a very active embryonic cell or a quiet adult cell) will largely determine the eventual outcome. The environment is more influential to our genetic expression than epigenetics. Still, on average only about 25% of the expression of a complex trait is related to environmental factors. So while the environment is important, it is still outdone 3:1 by our genome. Yes, epigenetics and the environment are important, but they influence, not control, the genome. We live in a sensory world. The five senses are vital in providing the input we need for our brain to understand the world and meaningfully interact with it. Different organs are needed to translate the optical, chemical or mechanical signals into electrical signals. Different parts of our brain then interpret these signals and their patterns. Our genes significantly influence this process. For example, if someone is born with red-green colour blindness then how he or she interprets the world will always be subtly different to someone with normal vision. Or a person born with congenital deafness will always interpret his or her environment in a different way to someone with full hearing. I’ve highlighted these two conditions because they provide stark examples to help demonstrate the point, but there are many unique genetic expressions in each of the five senses that subtly alter the way each of us perceives the world around us. So while we may all have the same photons of light hitting our retinas, or the same pressure waves of sound reaching our ears or touch on our skin, how our brains receive that information is slightly different for every individual. The information from the outside world is received by our sensory organs, but it is perceived by our brain, and even small differences in perception can have a big impact on the rest of the system. Professor Gregg Henriques explained it well in Psychology Today, “Personality traits are longstanding patterns of thoughts, feelings, and actions which tend to stabilize in adulthood and remain relatively fixed. There are five broad trait domains, one of which is labeled Neuroticism, and it generally corresponds to the sensitivity of the negative affect system, where a person high in Neuroticism is someone who is a worrier, easily upset, often down or irritable, and demonstrates high emotional reactivity to stress.”  The other four personality types are Extraversion, Agreeableness, Conscientiousness, and Openness to Experience. Gene x environment studies suggest that personality is highly heritable, with up to 60% of personality influenced by genetics , predominantly through genes involved in the serotonin  and dopamine systems [9, 10]. The “non-shared environment” (influences outside of the home environment) contributes heavily to the remainder [11, 12]. Personality is like a filter for a camera lens, shaping the awareness of our emotional state for better or worse, thus influencing the flow on to our feelings (the awareness of our emotions), our thoughts, and our actions. Watkins describes physiology as streams of data that are provided from the different parts of your body, like the heart rate, your breathing rate, the oxygen in your blood, the position of your joints, the movement of your joints, even the filling of your bladder telling you that you need a break soon. All of these signals are constantly being generated, and collated in different parts of the brain. Some researchers consider them positive and negative depending on the data stream and the signal its providing. They coalesce into emotion . According to Watkins, “emotion” is the sum of all the data streams of physiology, or what he described as “E-MOTION … Energy in MOTION.”  In this context, think of emotion as a bulls-eye spirit-level of our body systems. The different forces of our physiology change the “level” constantly in different directions. Emotion is the bubble that marks the central point, telling us how far out of balance we are. In the interest of full disclosure, I should mention that although emotion is a familiar concept, the work of literally thousands of brilliant minds has brought us no closer to a scientifically validated definition of the word “emotion”. Some psychologists and researchers consider it vague and unscientific, and would prefer that it not be used altogether . I’ve retained it because I think it’s a well-recognised word that conceptually describes the balance of physiological forces. “Feelings” are the perception of emotion. I discussed earlier in the chapter that what we perceive is different to what we “see” because the subtle genetic differences in our eyes and brains causes the information to be processed differently between individuals. The same applies to the perception of our emotion. That’s not to say that an optimist can’t have depressed feelings, or a neurotic can’t have happy feelings. In the same way that a coloured lens will allow a lot of light through but filter certain wavelengths out, most of our emotional state of being will come through the filter of our personality but the feelings will be subtly biased one way or another. Executive function of the brain is defined as a complex cognitive process requiring the co-ordination of several sub-processes to achieve a particular goal . These sub-processes can be variable but include working memory, attention, goal setting, maintaining and monitoring of goal directed action and action inhibition. In order to achieve these goals, the brain requires flexibility and coordination of a number of networks and lobes, although mainly the prefrontal cortex, parietal cortex, anterior cingulate and basal ganglia, and the while matter tracts that connect them. Executive functions process the incoming information and decide on what goals are best given the context, then plan the goals, execute them to the motor cortices, and monitor the action. Research work from Marien et al  demonstrates that unconscious/implicit goals can divert resources away from conscious goals especially if it is emotionally salient or otherwise strongly related. They also confirm that conscious awareness is not necessary for executive function but that implicit goals can be formed and executed without conscious involvement. Thoughts are essentially a stream of data projected into our conscious space. Baars [17, 18] noted that the conscious broadcast comes into working memory which then engages a wider area of the cerebral cortex necessary to most efficiently process the information signal. We perceive thought most commonly as either pictures or sounds in our head (“the inner monologue”), which corresponds to the slave systems of working memory. When you “see” an image in your mind, that’s the visuospatial sketchpad. When you listen to your inner monologue, that’s your phonological loop. When a song gets stuck in your head, that’s your phonological loop as well, but on repeat mode. Deep thinking is a projection from your brains executive systems (attention or the default mode network) to the central executive of working memory, which then recalls the relevant information from long-term memory and directs the information through the various parts of the slave systems of working memory to process the complex details involved. For example, visualizing a complex scene of a mountain stream in your mind would involve the executive brain directing the central executive of working memory to recall information about mountains and streams and associated details, and project them into the visuospatial sketchpad and phonological loop and combine them via the episodic buffer. The episodic buffer could also manipulate the scene if required to create plans, or think about the scene in new or unexpected ways (like imagining an elephant riding a bicycle along the riverbank). Even though the scene appears as one continuous episode, it is actually broken up into multiple cognitive cycles, in the same way that images in a movie appear to be moving, but are really just multiple still frames played in sequence. Our behaviour is not the direct result of conscious thought, or our will (as considered in the sense of our conscious will). We discussed this before when we talked about our choices in chapter 1. There are two main pathways that lead from sensory input to tangible behaviour – various automated pathways that take input from the thalamus, deep in the brain, and sent to motor circuits in the supplementary motor area and motor cortex of the brain. These can be anything from evasive “reflex” actions to rehearsed, habituated motor movements, like driving. Then there is the second pathway, coming from the executive areas of our brain, that plan out options for action, which are reviewed by the pre-supplemental motor area and the default mode network. This second pathway is amenable to conscious awareness. Like thought, the projection of different options for action into our consciousness helps to engage a wider area of cerebral cortex to process the data. Most of the possible plans for action have already been rejected by the implicit processing of our executive brain before consciousness is brought in to help. Once an option has been selected, the action is sent to the pre-supplementary motor area, the supplementary motor area, the basal ganglia and finally the motor cortex. According to the model proposed by Bonn , the conscious network has some feedback from the control network of our brain, providing real time context to actions about to be executed, and a veto function, stopping some actions at the last minute before they are carried out. This is largely a function of the basal ganglia , with some assistance from working memory. So as you can see, according to the CAP model, conscious thoughts are one link of a longer chain of neurological functions between stimulus and action – simply one cog in the machine. Thoughts are dependent on a number of processes that are both genetically and environmentally determined, beyond our conscious control. It’s simply wrong to assume that thoughts control the brain. Henriques, G. (When) Are You Neurotic? Theory of Knowledge: Psychology Today; 2012, 23 Nov 2012 [cited 2013 23 Nov 2012]; Available from: http://www.psychologytoday.com/blog/theory-knowledge/201211/when-are-you-neurotic. Watkins, A. Being brilliant every single day – Part 1. 2012 [cited 2 March 2012]; Available from: http://www.youtube.com/watch?v=q06YIWCR2Js. We often describe rapid unconscious movements, especially to evade danger or to protect ourselves, as “reflexes”. Medically speaking, a true reflex is a spinal reflex, like the knee-jerk reflex. When a doctor taps the knee with the special hammer, the sudden stretch of the tendon passes a nerve impulse to the spinal cord, which is then passed to the muscle, which makes it contract. A true reflex doesn’t go to the brain at all.